a little peace in me will die. promise not to stare too long. for this is not the miracle. a storm that blew so pure. and I could have the faintest idea. falcon spirals to the ground. so bloody red tomorrows’ clouds. a wind that blew so young. “This Is Not America” is a song from the soundtrack for the film The Falcon and the Snowman. 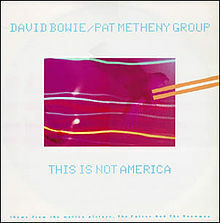 The track is the result of a collaboration between the jazz fusion Pat Metheny Group and rock singer David Bowie who provided the lyrics and vocals. It was released as a single which reached #14 in the UK, and #32 in the US. The Falcon and the Snowman is a 1985 film directed by John Schlesinger about two young American men, Christopher Boyce (played by Timothy Hutton) and Daulton Lee (played by Sean Penn), who sold U.S. security secrets to the Soviet Union. The film is based upon the 1979 book The Falcon and the Snowman: A True Story of Friendship and Espionage by Robert Lindsey, and features the song “This Is Not America”, written and performed by David Bowie and the Pat Metheny Group.